"I feel confident all the time. I'm an old man." 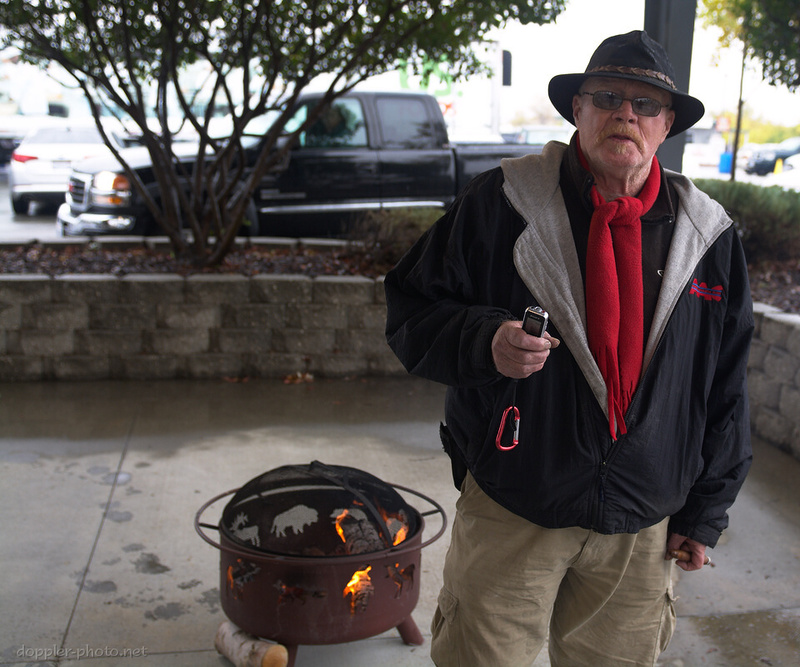 I bumped into Timothy "Red" Bray under the Thunderhill Grill canopy, warming himself by a small fire pit during the final rain-soaked hours of the race. He had a way of cutting to the chase that made each response seem like a nugget of hard-earned, well-worn wisdom. After a short false start, where he told me "I don't give a s___ about motorsports," we spent most of the interview discussing something he does care about: fires. Bray fights wildfires as an equipment operator. He used to work across the 11 Western States, but has since come to focus on California. He started off driving a bus (to move the firefighters around), then moved to operating water trucks and hauling equipment, like showers and laundries. He says, "It's a lot of fun and it pays real well. It's a little bit dangerous, y'gotta pay attention to what you're doing, but they pay you for the danger. That's okay. If I'm going to be in danger, pay me for it." Earlier in 2015, Bray had gone out 5 times on 4 different fires. 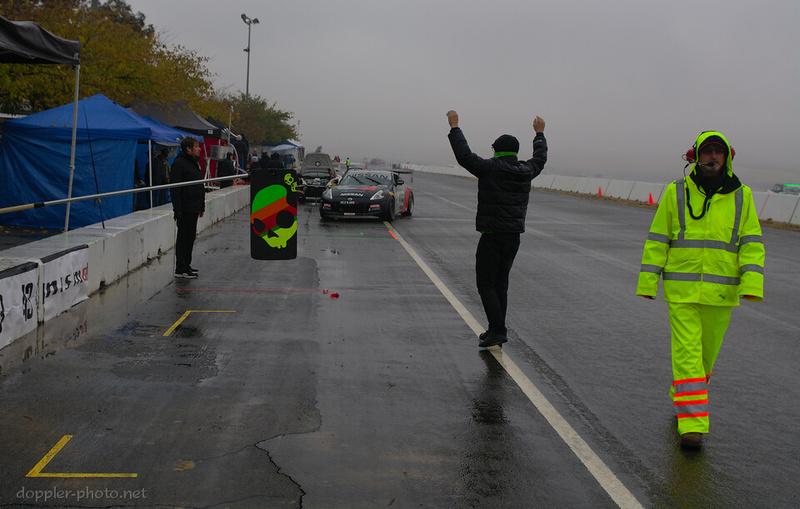 Now, he was at Thunderhill, waiting for the race to end so that he could pick up trailers that the organizers had rented for on-track shelter. Talking to him reminded me of the sheer diversity of supporting roles that are required to stage an endurance race, hot or cold, day or night, rain or shine. And it certainly did rain. This is a course worker whose job was to control the track entrance. If the entrance was closed for a serious incident, or if a particular car had to serve a timed-stop penalty, he was in charge. 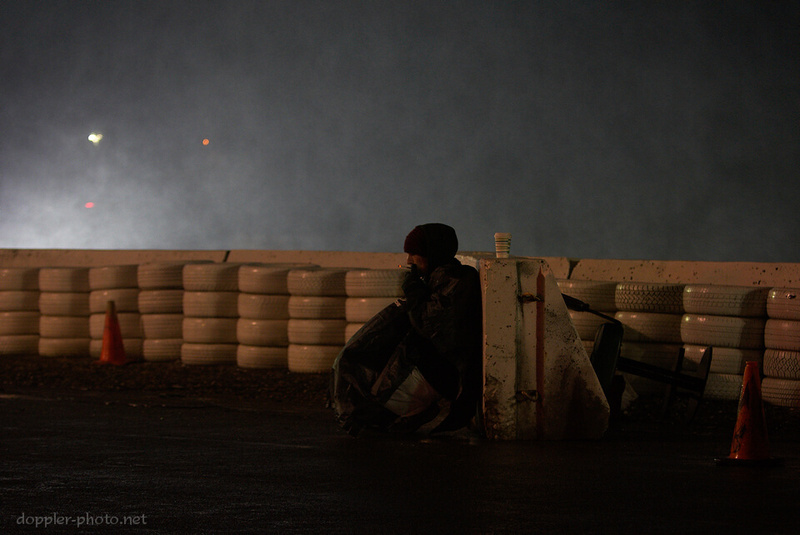 But during the times in between, he sat against a concrete wall, huddled in a tent-like outfit, and did his best to stay warm amidst the blowing wind, rain, and spray from cars flying by at 100+ mph. It's easy to watch a race without realizing how many people are tasked with rule enforcement. For instance, the race rules disallow any mechanical work on the vehicle while it's being fueled during a pit stop. Pit lane course workers like the one in this picture spend their entire shift on their feet, observing pit stops, and issuing warnings and penalties when appropriate. Even things as fundamental as verifying that all the right cars are on the track, and that they're in the right order for the start, are double-checked by hand prior to the green flag. If a car jostles a barrier hard enough, those get fixed by hand as well. 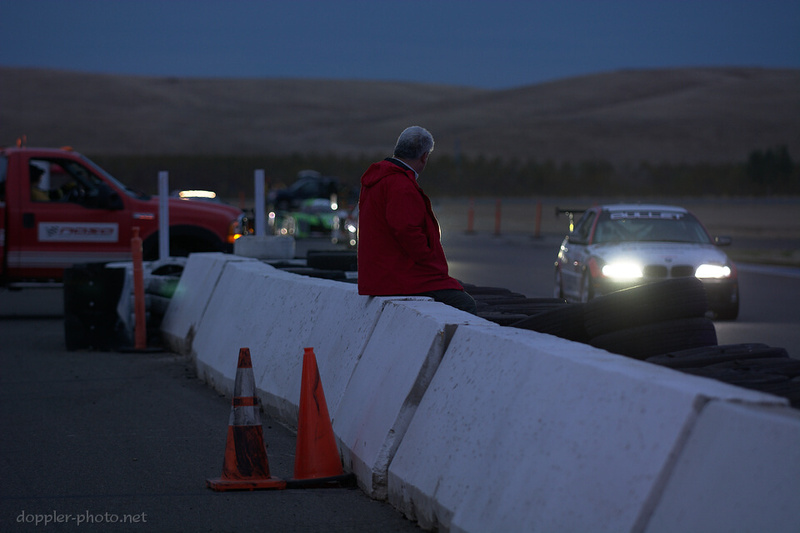 Here, NASA founder and executive director Jerry Kunzman waits for cars to pass by at low speed before continuing to direct the repair of a tire wall on Saturday evening. 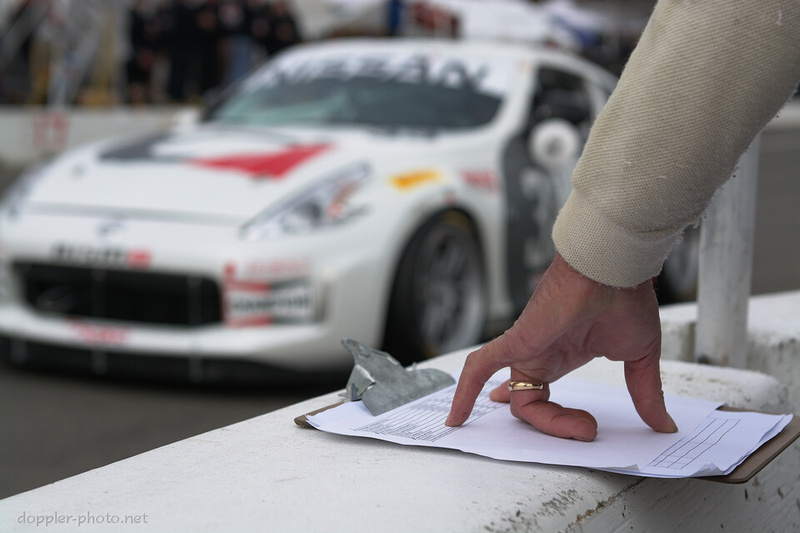 The National Auto Sport Association is the sanctioning body of the 25-hour race. 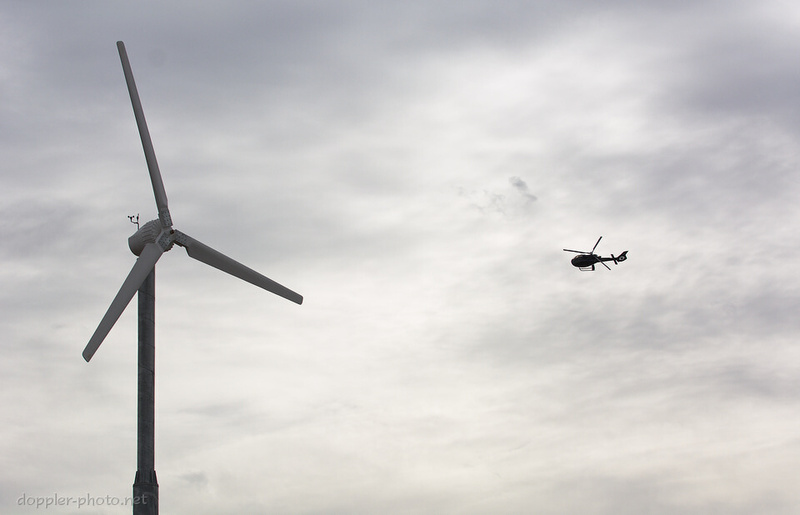 And finally, if a serious injury should befall someone at the track, there's a medivac helicopter on standby. Thank you for shining a light behind the scenes. The pilots get all the attention, but the supporting stuff are heros as much as anyone else. Looking forward to the next installment.